PHP is one of the most famous, open source scripting language that is specially designed for web development. Most of the websites are based on PHP, so the vulnerability assessment of PHP is one of the important pillar of web application security. There are so many automatic tools are available that can scan a web server, database and even applications for vulnerability but we also need to verify the code that used to develop the particular website and for this purpose we have PHP Vulnerability Hunter. What is PHP Vulnerability Hunter ? While most web application fuzzers rely on the user to specify application inputs, PHP vulnerability hunter uses a combination of static and dynamic analysis to automatically map the target application. Because it works by instrumenting application, PHP Vulnerability Hunter can detect inputs that are not referenced in the forms of the rendered page. During this phase, interesting function calls within each code file are hooked, and if code coverage is enabled the code is annotated. Static analysis is performed on the code to detect inputs. This is where the bugs are uncovered. 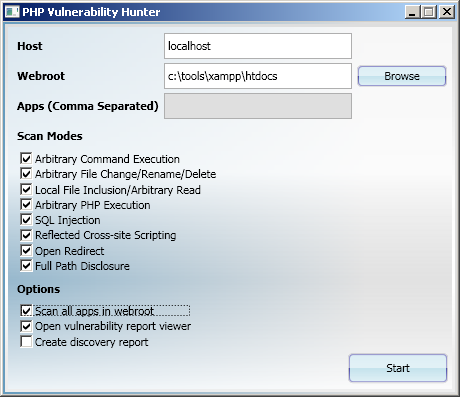 PHP Vulnerability Hunter iterates through its different scan plugins and plugin modes, scanning every file within the targeted application. Each time a page is requested, dynamic analysis is performed to discover new inputs and bugs.